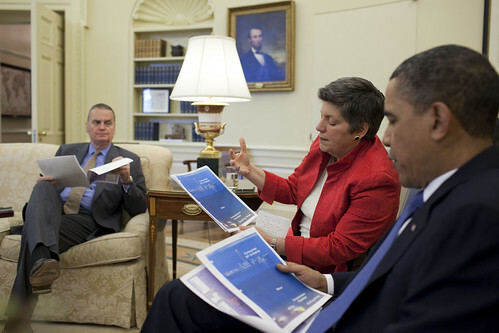 Original caption: "President Barack Obama meets with Homeland Security Secretary Janet Napolitano and senior administration officials, including National Security Advisor Gen. James Jones, left, in the Oval Office, regarding the situation in the Gulf of Mexico, April 29, 2010." Here are the Broken Ohms covering Talking Heads "Burning Down the House"
As you can see, I'm starting to scrape the bottom of my barrels, so leave your nominations for kitsch cover in the comments along with caption contest entries. Update: Wow, how had I missed this. Here's Tom Jones and the Cardigans covering the same song. Win. "Ok guys, watch the rhythm when we get to page 3. Let's sing it with feeling!" That Tom Jones / Cardigans cover is just further proof that we're living in the weirdest and most awesome of all worlds. Tom Jones' "Reload", the whole CD is full of win. This might have been the last CD I ever bought, way back in the day. "Sexbomb" was the big song in Madrid that year, when I was studying there. They played it in all the clubs.